Carmelo Anthony. The name instantly starts a conversation. On one hand, there are the Carmelo supporters who consider him as one of the elite players in the game. When you average over 25 points a game for your career, you’re entitled to those opinions. On the other hand, though, is the major criticism of his play. He tends to take a lot of shots to get those points, and outside of scoring, he really doesn’t do much else. His defense is almost nonexistent and he generally has some of the lowest assist numbers in the league, only averaging three assists per game in his career. There’s also the lack of winning that Carmelo has produced. Despite winning a national title at Syracuse in 2003, Anthony has seen minimal success in the postseason in the pros, only making it to the conference finals once as a member of the Nuggets. They ended up losing to the Los Angeles Lakers in five games. So with some many questions marks around him about his defense, decision making late in games, and if he can really win a title in the league, why do so many teams want him? Specifically, why would the Chicago Bulls, who thrive on defense and effort, want a guy like Carmelo Anthony? Personally, I am not a major fan of Carmelo’s game. I am one of the people who think that Anthony can’t win a title as the top guy on a team. But now, as the rumors continue to swirl that Anthony will become a free agent and potentially sign with the Chicago Bulls, I could see a situation where Anthony being a Bull could lead Chicago to it’s first NBA title post-Michael Jordan. Here’s how. First, and this is the biggest aspect of it all, is will Derrick Rose be completely healthy when the season starts. The former MVP has been plagued by injuries the last two seasons, tearing the ACL in his right knee two years ago and then tearing his meniscus in his left knee this past season. There are many questions surrounding Rose and his health, as the last full season he played was the MVP year of 2010-11. Coming off two knee surgeries will be tough, as people doubt Rose will still have the same explosiveness he had three seasons ago. Then, if Rose is healthy, another big question is would Anthony play second fiddle to Rose. Make no mistake about it: when Derrick Rose is healthy, he is the number one guy on the team. He single handily took the Bulls to the Eastern Conference Finals in 2010-11, and probably would be a top 5 player in the league right now if not for the knee injuries. If Rose is completely healthy, Anthony is going to have to deal with not being the go to guy, something he’s never been in his career. If Carmelo does buy in to being the second player behind a healthy Rose, this team could be very dangerous. Finally, will Melo play defense? That’s another huge question, as Bulls head coach Tom Thibodeau is one of the greatest defensive coaches in the league today. One of the reasons why Carlos Boozer hasn’t worked in Chicago is because his lack of defense, which is a major concern with Carmelo Anthony. Will Anthony buy in to Thibodeau’s system? 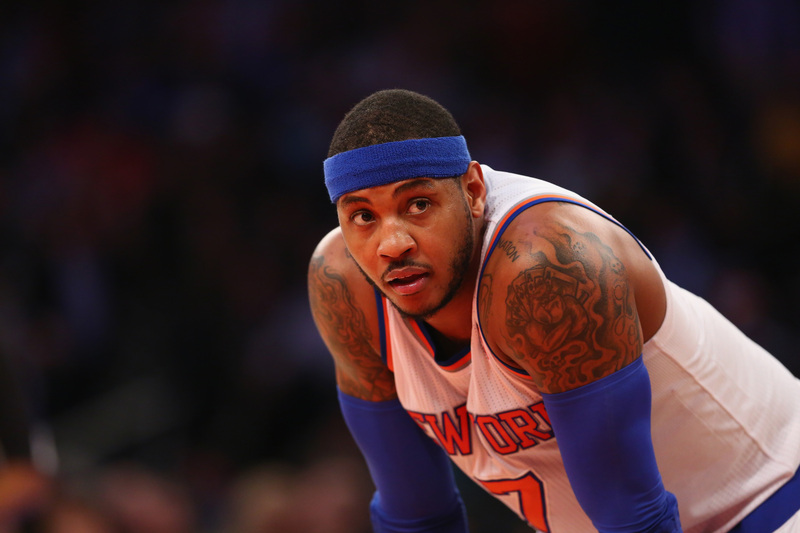 Will Carmelo even want to play defense to begin with? Many questions still need to be answered in that department. If he can buy into the system, though, there could be even more success in the Windy City next year. When it’s all said and done, though, the more I think about it, the more Carmelo could be a really solid piece to a Bulls team that has struggled offensively the last two seasons. If you could combine a healthy Rose, Anthony, and the returning defensive player of the year in Joakim Noah, Chicago could easily be right back in the hunt to make it not only to the Eastern Conference Finals, but potentially their first NBA Finals appearance since 1998. To make this move work, they’re going to have to amnesty Boozer’s contract, freeing up $13 million in space. From there, they’d probably have to trade their two draft picks (16 and 19) as well as one more guy. The name floating around is Taj Gibson. Although it would be unfortunate to see a player like Gibson leave, getting Carmelo Anthony may just be worth it to the Bulls front office. Although Gibson has become a fan favorite in Chicago, the Bulls may have to part ways with him to bring in Melo. There’s so many “what ifs” to this whole situation. All I know for certain is that the front office wants Carmelo. Thibodeau wants Melo. Noah has been trying to persuade Melo to come to Chicago since the All Star Break in February. When it comes down to it, Anthony may be putting on a Bulls number 7 jersey come November.